It depends on how you mount the mic. in the Turtle, as you can mount it so that the end it totally protected - but, you also need to minimise changes in the sound, so having the head slightly protruding does this. years ago (early 1980's) my mentor (Mark Fitzgerald-Rosewood Sound-Syracuse NY) used to do Sound reinforcement for several large Irish music festivals (e.g. Caeili Music festival-Philly PA). We were his pupils at SU and did a lot of work for him from 1981-1984; one of the festivals asked him to provide "better" reinforcement for the dancers/cloggers. He decided to go with the Crown PZMs and we would place them near the running lights at the stage lip.we tried facing them with different geometrical locations including upside down. Of course, upside down wasn't the greatest, but we tried it all. We had several dancers step on the mics accidentally and accept for the transient bump from the PA, the mics survived. Spilling Guiness Beer inside one may have damaged it, however, it still worked after we dried it out. For the marhcing band, I would tend toward these PZM's on plexi-glass, maybe 4-6 of them on stands with maybe some shotguns stationed at mid field angled toward the 25 yard lines. I have seen Teevee productions where the band is in the stands and they have mics (I assume cards) aimed at the band usually 2-4 mics spread out in front. At SU, they used to mic us (I was in the marching band-not doing PA) with SM57s across the front row with an extra one or two closer to the woodwinds when we were in the stands. But of course, this was just for reinforcement not for recording. Sorry to ramble, thought I was adding $.02 but it may read more like $.10! From what I read, the reason for using plexiglas in the first place was because they wanted something less visibly intrusive. That is, people could see through the plexiglas and it didn't stand out so much but still offered a solid plane on which to mount a microphone. That's why they were firmly held. Here's a link to a page with lots of bundary-mounting info, including most of the old authoritive Crown document, which does a good job describing what's going on including the combfiltering effect Jon mentions and describes some interesting multi-planar boundarires. The full Crown PDF is linked there, which as I recall also includes the mathematical formulas for calculating the effect of specific boundary-areas and such. 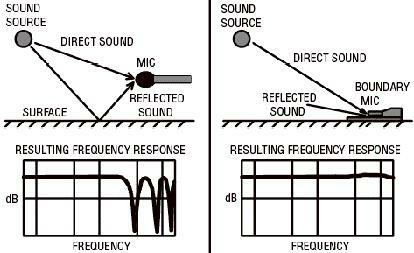 The page linked here primarily deals with nature recording, and shows lots of small DIY stereo baffles similar to the Crown SASS below the Crown document info. Those things will only leverage the boundary-effect and act directionally at high frequencies due to the small area of their boundaries. Here's a couple brief clips from the recording I just made of the band. I was on top of a ~25ft scaffolding, right above the drum major and almost directly in front of the pit instruments. Even at that height, I chose to point the mics almost straight out parallel to the ground, rather than angled down as I would normally do when recording from high up. If I had angled down, the pit would have been even hotter in the recording than it was. These mics are really subcards though despite what the manufacturer says, so I felt it was a good compromise (check the polar response here: http://www.lineaudio.se/CM3.html). As I said before, I won't be able to have this placement ever again this season, but it was the only option as they were playing on a practice field and not in a stadium. This was my first run with the CM3s and the Tinybox, and was the first public run of the show for the band. Oh, and back to the original purpose of this thread - I was using the Church Dead Rats on the CM3s, but they barely fit without room for the foam screens underneath. It was threatening rain and was quite breezy so they did their job well I think. I just ordered a pair of TBrown's Muppets so I can have a set that are appropriately sized for these mics and will allow me to use the foam screens as well. Do you happen to have any pictures you could post? I'm curious about the position of the band relative to the mics and also curious about the size of each section in the band. In the first clip, the brass seemed weaker than the percussion which I'm assuming was due to the percussion being closer to the mics? Sorry, no pictures and I'm already pushing what I feel comfortable with posting. This is a school, remember. I'm looking at the video and can tell you that in the first clip the winds and brass are in a straight across "company front" with the saxes left; flutes and clarinets center, and brass to the far right. They move a bit after that but the L-R distribution stays generally the same during that clip. The drum line is to the left behind the saxes. The drumheads are pretty much aimed right at the mic position, wheras the horn facing is more or less straight ahead - not towards the 50 where I was. Large ensembles are always hard to record. Add outdoors and moving and whatever other variables and it seems fortunate to end up with any good representation. IMO internal balance is mostly a function of the players (in any band really, though especially of this size) and they're not hearing it the same way the audience does. Regardless it usually takes a lot of experience for players to get that aspect nailed down (some never do!). Individual micing is not a panacea even with a fixed seated group, so to a large extent you get what you get bounded by some limited range of technical choices you may be able to make on the margins. This is pretty impressive. The band is good too. Interesting to hear those mics in use in a very different setting. Thanks bomb. The kids are working really hard and performing in that setting is very difficult. And it's worse if you have reverb from stands in a stadium. You have to completely trust the drum major and ignore what you're hearing from a timing standpoint otherwise it's a hot mess rhythmically. As far as a different setting, there's a chamber choir I sing with and I've offered to record our performances in October. Last time I recorded us it was with CA14s so I'm looking forward to trying out the new rig for comparison. I really love these mics so far, and I think it's a shame they aren't more popular outside of Europe. I like the sound of these clips. I would agree that aiming parrallel to the ground is "better" than aiming downward toweard the band. good job and thanks for sharing the clips so we can understand what you are doing mic-wise. I recorded a large choir back in May with a pair of CM3s (NOS, on top of 10' light stand on top of about a 2' platform) , and it seemed to me that they were very pleasant and smoother sounding than whatever it was the church used for their own recording. I ended up using their video and my audio just because I liked the CM3 audio better. I suspect I may have run into a negative aspect of gain from boundary mic recording by accident. I set my camcorder down on a sill in an about a 3x6 opening in the back wall of the church to record a joint elementary/teen choir last week when I had to run out to another meeting. When I first watched the video later, I thought, wow, those kids are really singing, and then I started hearing slight distortion in the recording. Puzzling since the camcorder was set on automatic gain. The kids weren't even mic'd. hmmm, I wonder if that opening acted like a funnel and the sill acted like a boundary which was too much for the internal mic on the camcorder? So now that's at least one other person on TS that has these! Time for a Team Line Audio thread I guess. That's exactly how I intend to use them myself (same height stand, same spacing). When using regular cardiods for choir, I would always go with DIN or ORTF if in a nice acoustic, but the CM3s seem to need a bit more spacing. I've spoken to people who have gotten good results with distances as small as 24cm for close-up recording. I won't get the chance to do large choirs until January, but will have a few small choir recordings in the next few months. Regarding your camcorder, who knows what kind of wacko stuff the auto gain may be doing. My camera very obviously jacks the gain way up when it senses the average noise level dropping for any significant period. For the marching band show I just recorded, that meant anytime the band had a rest of more than a second or so, up the gain went and then unfortunately the wind and background noise along with it. Basically my camera audio is unusable for anything but dialogue, indoors, at steady level and close distance. And half the time that sounds like crap. This is a point-and-shoot camera though; not a dedicated camcorder. Does your camcorder have a shotgun or other type of directional mic? Because then you could have been having proximity effect issues with it picking up the reflections off of close boundaries. Even if that wasn't happening, at the distance that the mic probably was from said boundaries, you could have been getting all kinds of comb filtering / phase cancellation. As described by Jon and Gutbucket earlier, a real boundary application means the capsule is very close to the boundary to both maximize the boundary effect and also avoid the comb filtering you get at intermediate distances. Combine that with auto gain and things could get pretty dicey. It's a Canon Hf M500 camcorder, and the microphones are on the bottom of the face of the camera under the lens. No idea what kind of internal mics they are. I don't think I'll be putting the camera on a flat surface and recording like that again if I can avoid it. I'd be very interested to hear some comparison samples of CM3 recordings of the marching band from wherever you record from the next time.